Small towns in New Hampshire are struggling to find and keep quality police chiefs. 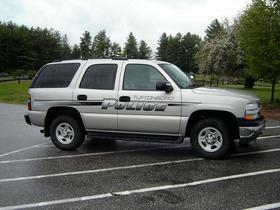 This fall, the town of Newbury let it's police chief go. Bristol's police chief resigned, citing personnel issues. And the town of Webster had disagreements with its police chief, a dispute which ended up in court. Andrew Shagoury is the police chief for the town of Tuftonboro, and the president of the New Hampshire Association of Chiefs of Police. Morning Edition Host Rick Ganley spoke with Shagoury about the difficulties with hiring police chiefs in smaller towns. What are some of the challenges with hiring in these small towns? I imagine that the applicant pool is much smaller. It can be small. I often tell somebody considering applying: why did the prior chief leave? Did they retire, or was there some issue that came up? You have to fit the community. I think that’s the key part. Is this the community the right fit for you, and are you ready to step up? It’s probably one of the hardest jobs in law enforcement, because you don’t have as many filters between who you have to answer to. I want to ask you about that, because what are the difficulties working with say select boards in some of these small towns? I understand it can be highly politicized. Has it always been that way, or is this just kind of a sign of the times? I think it’s always been that way. Why I say that is because there’s a law that went into effect back in , RSA-1052A, and it’s been modified a few times along the way. But it talks about the powers of police chiefs, and I think it’s an attempt to remove some of the politics out of it so that police chiefs can do what they’re supposed to do, not necessarily do what they feel they have to do to keep a job. Sometimes there can be pressures to maybe do things that are contrary to the law and evidence. What about beyond some of those concerns, about managerial concerns like that, are applicants not thinking about life in a small town or becoming a part of a community? Or as you said, I think there’s a fit issue here, right? It’s tough in a small town. I mean, people know your business. You’re in a fish bowl. Even some officers see that as opposed to being in a large community where you might blend in even if you don’t live there. But being in a small town, people know your life and what’s going on with you, which you have to be able to handle that and accept that. And the other difficulty [is] I think, you don’t stop being chief. Sometimes, especially in these smaller towns, you are everything else too sometimes. You still have to do animal control. You still have to have somebody handle property and evidence, handle training, be a liaison with the school. There may be not a full time school resource officer. And [they have to handle] patrol. All these things still have to be done by somebody, and I think that’s sometimes a conflict that comes up. I know of one town where they expected the chief to attend a weekly event that was going on in town, and then also hang out in front of the school when it opened and closed every day. And that event, like say it was on a Saturday, pretty soon it’s like they expected every day the chief, and he was the only officer, to be there. And it’s like, people do get vacations and time off. And you still have to be chief and handle policy development, and still have training and professional development so they are prepared to make sure they’re following the new court rulings. You need to wear many hats obviously. Wear many hats, and you don’t have as many people sometimes to share that with. You have to be willing to be engaged in the community, and you can’t sit behind your desk. I think there’ve been times in small towns, people have come in on an applicant side thinking I’m going to come in. It’s going to be quiet. There’s no expectation that they’re going to be out actually patrolling. They’re going to be out stopping cars. People are going to want to see them visible and out in the community. They’re going to want to see them in uniform and out and about. The Board of Selectmen of Montague, Massachusetts, was scheduled to meet Monday night to confirm an acting police chief.